Ecommerce is developing at a rapid pace; showing little sign of slowing down it is set to progress further into 2016 as consumers continue to demand and expect more of brands and retailers. 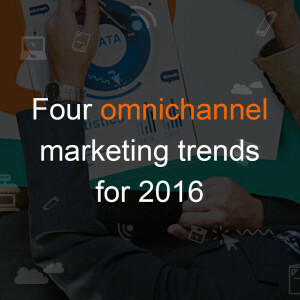 2015 proved to be a remarkable year for innovation, with marketers recognizing the importance of omnichannel integration across their sales and marketing channels. Here, Kamal Karmakar of iVend Retail (pictured) outlines four key global omnichannel marketing trends we can expect to see over the next 12 months. Mobile has been much discussed for some time, but 2016 will finally see brands and retailers implement a truly mobile-first approach to marketing campaigns. With 60–70 percent of consumers using a mobile to view potential purchases, the importance of this channel can no longer be ignored as it presents an unparalleled opportunity to have a one-to-one conversation with consumers on a device that is always-to-hand. Although mcommerce is already in full swing, businesses will begin to develop a mobile first strategy using mobile apps to capture audience attention and retention. By integrating online and offline offerings brands are more likely to resonate with target customers and begin to build loyalty with those audiences. Flash sales will continue to prove popular hooks for retailers, but brands will need to think about the implementation of these more carefully when it comes to profitability. As we have seen from Black Friday sales, once returned items are taken into account, profits are greatly eroded. Coupled with the minimal margins that were implemented to drive prices down for consumers, it soon becomes evident that flash sales are rarely used solely for profit. The reasoning behind continued participation will come down to gaining market share as competition is high and almost all brands will be taking part in seasonal sales, promoting tempting offers and potentially encouraging competitors’ loyal customers to try out their products instead. To achieve success, while minimizing negative effect on profit, companies need to invest in a robust omnichannel marketing strategy to drive hype around offers and secure maximum conversion rates and share of voice. Brands have been flirting with the idea of personalization in 2015 but 2016 will be the year that brands will start to demonstrate successful personalized marketing campaigns. By tailoring interactions with customers and starting a one-to-one conversation, brands and retailers will spark interest and see ecommerce excel in terms of engagement levels. Using purchasing history to their marketing advantage brands can target consumers with relevant messages that will help capture attention and as a result drive conversions. Revenue growth will come from current customer databases. Brands have three options when it comes to expanding the businesses and can target either existing customers, a competitor’s customers or go after new customers. For the best results brands should look at their existing customer database and streamline performance to optimize the data they have to hand already. By concentrating on existing customer databases businesses brands will begin to understand customer shopping behavior and determine what is and isn’t working in regards to each touchpoint.